She deserves the most fascinating flowers in the world. 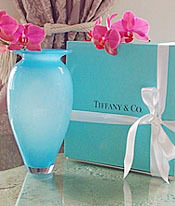 This hand-blown azure vase from the Tiffany Studio Collection holds a dozen magnificent Alabaster White Phalaenopsis that will take her breath away. Or take your inspiration from these blooms’ perfect crimson lips and “stop her mouth with a kiss.” The perfect gift for the perfect woman in your lifeonly from Beautiful Orchids. 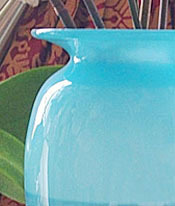 Tiffany Studio Jade Blue vase. Hand-blown glass, 6.5" high. Signed and gift wrap in a blue box. The arrangement above was created with 12 perfect stems of freshly cut White Phalaenopsis with crimson red lips in our 2002 Tiffany Jade Blue vase. Each purchase includes care instructions and an exquisite gift card for your personal message. 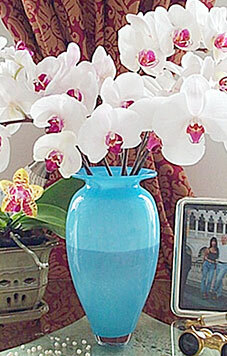 Each stem is approximately 12-15 inches tall bearing 4-8 blooms and comes with individual water vials. The flowers measure approximately 2.5-3 inches in diameter.